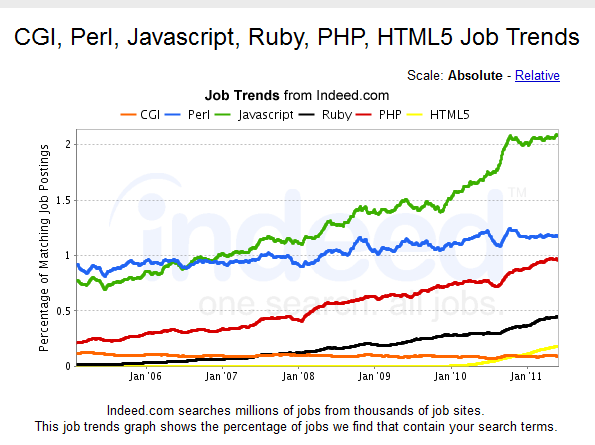 Indeed.com, an up-and-coming job search website, has an interesting trends search feature. Because you easily argue that the rational side of Silicon Valley hype waves is driven by jobs/employment, one great way to analyze these technology waves is to analyze job postings. Let’s have some fun. Note how HTML5 (in yellow) is flying up the rankings. Now, let’s take a look in database-land. 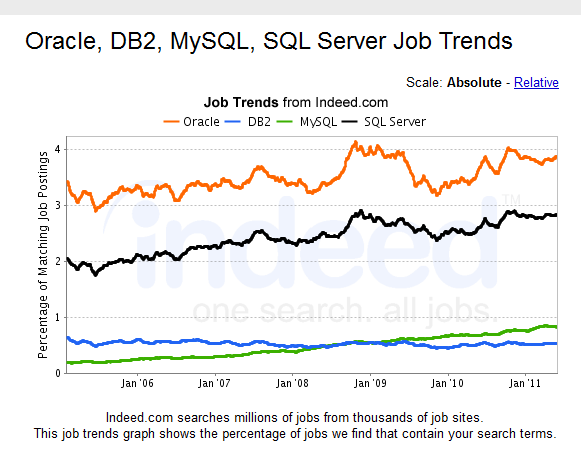 Now, let’s take a look in NoSQL land. 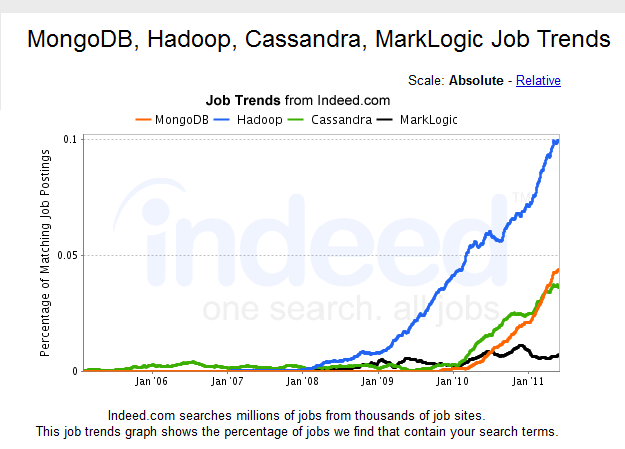 I’m not surprised to see MongoDB and Hadoop shooting up the charts. Frankly, I thought Cassandra had lost some momentum, but I guess not. Finally, let’s take a look in semantic web-land. 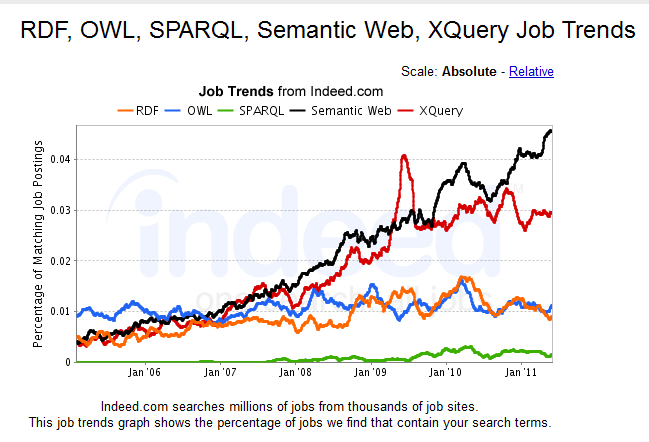 I don’t actually view XQuery as a semantic web technology — I just threw it in for fun — and was surprised to see that XQuery generally correlates better with semantic web than actual semantic web technologies like RDF or OWL! Finally, note that the scales are not the same. The first two charts are in percent of job postings, the third is in tenths of a percent, and the fourth is in hundredths of a percent. So the sobering example is to take the top trend from each of our four charts and graph them together. Thanks Dave for another great post. 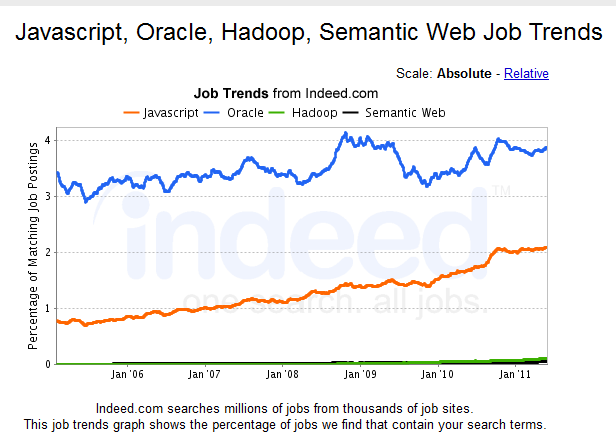 I’ve been thinking, in an effort to stay young, I need to pursue some Hadoop training. The books and online training available help but the trends you point out confirm what I feel in my gut, I need to learn Hadoop faster. Thanks, as I recall, many were at MarkLogic itself. Good post in making people aware of the excellent Indeed.com Trend tool. I use it regularly to see the adoption rate of various new technologies. I’m generally a MS dude, so I’m generally focused on the MS stack.